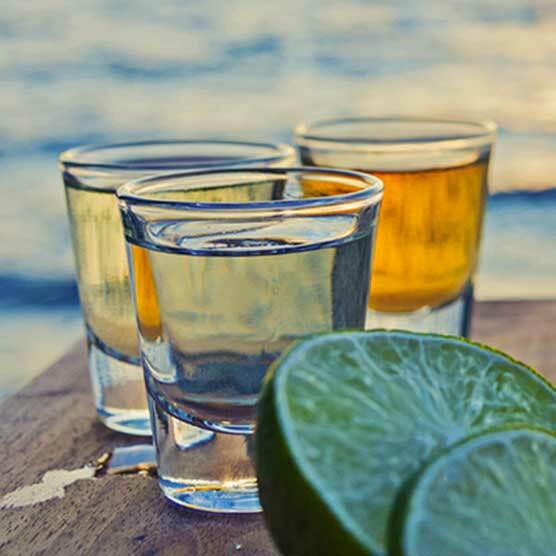 Why: The unofficial tequila headquarters in the centre of Jalisco’s Tequila Town, La Capilla has become an institution for the locals and visitors who come here to taste skilfully crafted tequilas. This unpretentious cantina has been bagging awards since the 1950s, and given the extensive list of tequila cocktails it serves coupled with superlative service, it’s easy see why. Don’t expect anything too fancy here, you’ll be greeted by a plywood bar counter fronted by a few stools, plastic tables and chairs, and most importantly, the infectious smile of the celebrated owner and bartender Don Javier Delgado Corona. He's now in his 80s, but is still around to shake things up with his famous tequila cocktails. What to drink: Batanga, of course! This amazing cocktail invented by Don Javier is made with tequila, fresh lime juice and Coca-Cola, stirred with a long knife. Why: Located on the northern end of the hip beach resort of Playa del Carmen, the three-level Canibal Royal has a distinct Brazilian vibe to it, with stone tile flooring similar to the one on the sidewalks of Rio’s Copacabana beach. At the first level is a beach bar, the second level is a restaurant with spectacular views of the Gulf of Mexico and the third is a solarium with Jacuzzis. Unwind on sun loungers on the palm-lined beach with a cocktail in hand and ceviche tacos or grilled octopus to nibble on. Next time you book a holiday to Cancun, don’t miss this tequila gem by the Playa del Carmen beach. What to drink: Sip tequila on the rocks or seafood cocktails, but should you need variety, micheladas (chilled beer mixed with lime juice, spices and sauces) are available too. Why: Not only will you be met by a dizzying array of cocktails in this quirky tequila library, but you can also discover the art of making them, too. Set in the basement of Zengo restaurant in Murray Hill, the atmospheric La Biblioteca boasts a gothic yet cosy decor, complete with black walls, Persian rugs, tufted black sofas and long wooden tables with library-style desk lamps. Marvel over 400 varieties of tequila (yes, really) as well as mezcals and sotol. Guests can even rent a private tequila locker and store bottles for up to six months - perfect for any party planners out there! If you fancy stopping by during the week, tequila tastings are held on Tuesdays where mixologists share stories on agave spirits. What to drink: You'll have plenty to choose from at La Biblioteca, but Perfect Paloma (el Jimador and Mexican Squirt) and Poblano Escobar (cumin, muddled poblano chile, pineapple, lime) are favourites. Why: If you’re looking for a tequila experience closer home, look no further than the cantina-style Café Pacifico, nestled amid the swanky boutiques in Covent Garden. The Mexican feel is evident in the kitschy interior, thanks to the classic Mexican dishes and fabulous list of 100+ varieties of tequilas and mezcals. Savour the flavour straight on the rocks, mix the spirit into a Margarita or go all out with one of the delicious house cocktails, which are served by the glass or pitcher. The tequila bar has been giving Londoners a splash of Mexican spirit since the 1980s, and there's no plans in stopping any time soon. What to drink: Start with house cocktails like Palomita Muerta and La Cura, before moving to speciality margaritas - perfect for washing down fiery fajitas, burritos and chimichangas! Why: What looks like a colourful food truck and reminds you of a Mexican taco joint, is actually a stylish two-level bar hidden behind the restaurant. Bodega blends industrial decor with an opulence, thanks to the classy velvet sofas and Persian carpets! Tequila – taken as shots or craft cocktails – is what attracts South Beach revellers here, but don't worry if you’re clueless about what to order - it’s best to go with the bartender’s choice. The food menu is lip-smacking, comprising of traditional style tacos, burritos and guacamole, making it a hot spot for hungry beachgoers to head to. This particular gem celebrates National Tequila Day with a special tequila cocktail menu complemented with music – even more reason to plan a holiday to Florida! What to drink: Paloma Paloma cocktail (Don Julio Silver, Ancho Reyes, agave, grapefruit, lime and salt) or Smoked Horchata shot (mezcal with creamy rum, topped with grated cinnamon).